The ex-COMELEC chair Sixto Brillantes Jr. who also a consultant of the vice president candidate Senator Ferdinand Marcos Jr. claimed that there's so many stupid people in the country. Brillantes criticized an electoral sabotage case filed by concerned citizens of the Philippines. Former Commission on Elections chairman says that ‘there can be no cheating’ using unofficial results. Brillantes said the following statement on Wednesday, May 18, after the said case filled against the Comelec, technology provider Smartmatic, and election watchdog Parish Pastoral Council for Responsible Voting. "Ano ba naman. Ang dami namang bobo rito sa Pilipinas, (What’s going on? It looks like we have many stupid people in the Philippines.)" he said. According to the Republic Act 9369, "Any person or member of the board of election inspectors or board of canvassers who tampers, increases or decreases the votes received by a candidate in any election or any member of the board who refuses, after proper verification and hearing, to credit the correct votes or deduct such tampered votes:"
"Provided, however, That when the tampering, increase or decrease of votes or the refusal to credit the correct votes and/or to deduct tampered votes to deduct tampered votes are perpetrated on a large scale or in substantial numbers, the same shall be considered, not as an ordinary election offense under Sections 261 and/or 262 of the Omnibus Election Code, but a special election offense to be known as electoral sabotage and the penalty to be imposed shall be life imprisonment," on SECTION 27, letter (b). The root of this issue was when the election-related hash code was changed without the Comelec en banc’s permission. And the group named, "Mata sa Balota Movement," filed the case and citing the said issue as a committed electoral sabotage. They claimed that this unauthorized change has affected the partial, unofficial tally of votes, according to GMA News. Mata sa Balota Movement reportedly said, "This case presents a classic example where the respondents, in conspiracy with each other, exercised their duty in bad faith, maliciously, arbitrarily and capriciously." But Sixto Brillantes questioned the statement of the said group and said, "How can there be electoral sabotage when it is unofficial?" 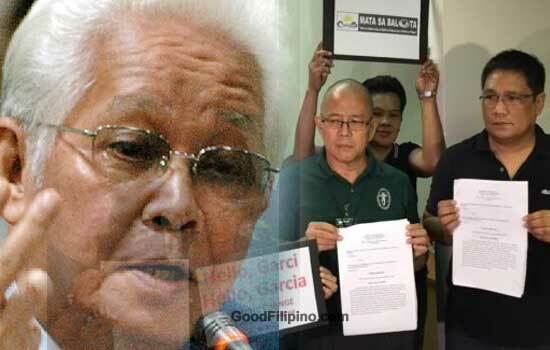 Do you agree with Sixto Brillantes statement on electoral sabotage case? Please share your thoughts below. Comments or suggestions about "Ex-COMELEC chair on Poll Sabotage Case: 'So many stupid people in the Philippines'" is important to us, you may share it by using the comment box below.